The Feast of Tabernacles is seven days long—picturing the entire millennium. Seven is God’s number of completeness. Therefore, there are also seven Feasts. “On the fifteenth day of this seventh month is the feast of tabernacles for seven days unto the Lord…On the eighth day shall be a holy convocation unto you…it is a day of solemn assembly; ye shall do no manner of servile work” (Lev. 23:34, 36). This eighth day is also called ”the last day, that great day of the feast” (John 7:37). What does this final Holy Day represent? Note what Jesus said on that day. “If any man thirst, let him come unto me, and drink…out of his innermost being shall flow rivers of living water. (But this spake He of the Spirit, which they that believe on Him should receive)” (John 7:37-39). Jesus’ sermon speaks to the significance and meaning of this Last Great Day. After the Millennium, after Satan is briefly “released from his prison” (Rev. 20:3, 7), then cast away “forever and ever” (Rev. 20:10), there is a completely new event. “Then I saw a great white throne and Him who sat on it, from whose face the earth and the heaven fled away. And there was found no place for them. And I saw the dead, small and great, standing before God” (Rev. 20:11-12). There is a resurrection! All of the dead—”small and great”—stand before God! This couldn’t include true Christians today. They are resurrected when Christ returns. It couldn’t refer to those converted during the millennium. They have inherited the Kingdom during the millennium, after living out a normal life span. Those in this resurrection can only be those who died in ignorance in ages past! Now alive after the millennium, after Satan and the demons are gone (Rev. 20:5, 10). These are “the rest of the dead” who “did not live again until the thousand years were finished. The first resurrection was the Firstfruits. Those who live into and during the millennium are not “the rest of the dead,”—as they were not dead! 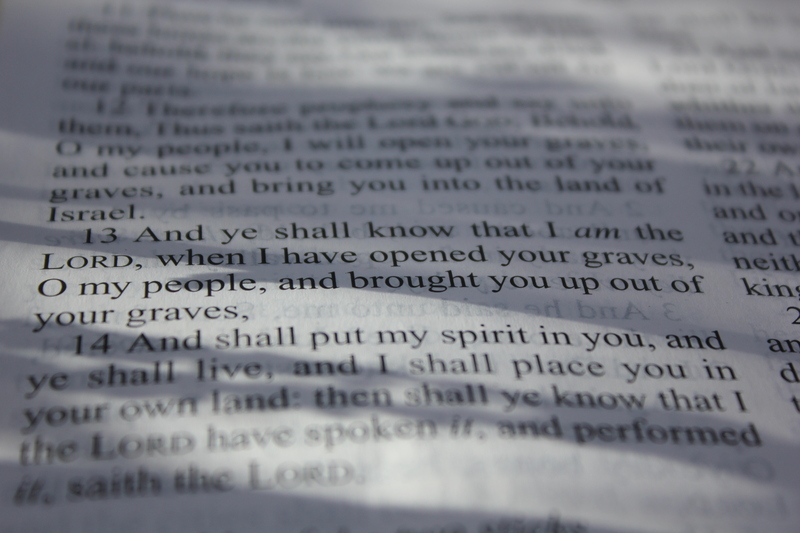 Christ has promised that All in their graves will hear His voice, and come forth. “Marvel not at this: for the hour is coming, in the which all that are in the graves shall hear his voice, And shall come forth” (John 5:28-29). Holy Days For Christians Today? Are You Worthy to Take Passover? Ready, or Not, for Pentecost? “Of the increase of his government and peace there shall be no end” (Isa. 9:7), yet this human experience will have a conclusion! This day is mentioned in Mat. 10:15. It is a time when Gentiles, when all, who died in ignorance will be given an opportunity to receive salvation (Ezek. 16:53-55). Even those in Israel who died in their sins will be given their first opportunity to understand the Truth of God and His Way of Life (Ezek. 37). The prophet wrote that God would pour out His Spirit on those resurrected (Ezek. 37:14). This is precisely the salvation which Jesus spoke of in His sermon on that great day of the feast, as He preached near the end of His ministry. This will be a physical resurrection, when God will place His Holy Spirit into His people Israel, and then provide salvation for them! “The hand of the LORD was upon me, and carried me out in the spirit of the LORD, and set me down in the midst of the valley which was full of bones, And caused me to pass by them round about: and, behold, there were very many in the open valley; and, lo, they were very dry. And he said unto me, Son of man, can these bones live? And I answered, O Lord GOD, thou knowest. Again he said unto me, Prophesy upon these bones, and say unto them, O ye dry bones, hear the word of the LORD. Thus saith the Lord GOD unto these bones; Behold, I will cause breath to enter into you, and ye shall live: And I will lay sinews upon you, and will bring up flesh upon you, and cover you with skin, and put breath in you, and ye shall live; and ye shall know that I am the LORD. So I prophesied as I was commanded: and as I prophesied, there was a noise, and behold a shaking, and the bones came together, bone to his bone. And when I beheld, lo, the sinews and the flesh came up upon them, and the skin covered them above: but there was no breath in them. Then said he unto me, Prophesy unto the wind, prophesy, son of man, and say to the wind, Thus saith the Lord GOD; Come from the four winds, O breath, and breathe upon these slain, that they may live. So I prophesied as he commanded me, and the breath came into them, and they lived, and stood up upon their feet, an exceeding great army. Then he said unto me, Son of man, these bones are the whole house of Israel: behold, they say, Our bones are dried, and our hope is lost: we are cut off for our parts. Therefore prophesy and say unto them, Thus saith the Lord GOD; Behold, O my people, I will open your graves, and cause you to come up out of your graves, and bring you into the land of Israel. And ye shall know that I am the LORD, when I have opened your graves, O my people, and brought you up out of your graves, And shall put my spirit in you, and ye shall live, and I shall place you in your own land: then shall ye know that I the LORD have spoken it, and performed it, saith the LORD . . . . I will take the children of Israel from among the heathen, whither they be gone, and will gather them on every side, and bring them into their own land: I will make them one nation in the land upon the mountains of Israel; and one king shall be king to them all: and they shall be no more two nations, neither shall they be divided into two kingdoms any more at all: Neither shall they defile themselves any more with their idols, nor with their detestable things, nor with any of their transgressions: but I will save them out of all their dwellingplaces, wherein they have sinned, and will cleanse them: so shall they be my people, and I will be their God. And David my servant shall be king over them; and they all shall have one shepherd: they shall also walk in my judgments, and observe my statutes, and do them. And they shall dwell in the land that I have given unto Jacob my servant, wherein your fathers have dwelt; and they shall dwell therein, even they, and their children, and their children’s children for ever: and my servant David shall be their prince for ever. Moreover I will make a covenant of peace with them; it shall be an everlasting covenant with them: and I will place them, and multiply them, and will set my sanctuary in the midst of them for evermore. My tabernacle also shall be with them: yea, I will be their God, and they shall be my people.” (Ezek. 37:1-14, 21-27). Immediately following after the seven days of the Feast of Tabernacles now pictures completion of God’s Plan of Redemption. It occurs in the context of the new heaven and the new earth: “For, behold, I create new heavens and a new earth: and the former shall not be remembered, nor come to mind” (Isa. 65:17). All parents and children, young and old, will be resurrected. “They are the seed blessed of the LORD, and their offspring with them” (Isa. 65:23). “for, behold, I create Jerusalem a rejoicing, and her people a joy. And I will rejoice in Jerusalem, and joy in my people: and the voice of weeping shall be no more heard in her, nor the voice of crying (Isa. 65:18-19). This final day of salvation, Isaiah tells us, will last 100 years. “There shall be no more thence an infant of days, nor an old man that hath not filled his days: for the child shall die an hundred years old; but the sinner being an hundred years old shall be accursed” (Isa. 65:20). “And they shall build houses, and inhabit them; and they shall plant vineyards, and eat the fruit of them. They shall not build, and another inhabit; they shall not plant, and another eat: for as the days of a tree are the days of my people, and mine elect shall long enjoy the work of their hands. They shall not labour in vain, nor bring forth for trouble” (Isa. 65:21-23). The book of life—typifying salvation—is opened (Rev. 20:12). Revelation presents the final view of the White Throne Judgment Period—the conclusion of this 100 year period (Isa. 65:17)—as the present material heaven and earth are perishing (Rev. 21:1)—and the faithful are receiving their eternal reward at the throne of Christ (Rev. 20:13, 15). For those who never knew—there will be 100 years to learn, to overcome, to bear fruit and get one’s spiritual house in order. “. . . Behold, the tabernacle of God is with men, and he will dwell with them, and they shall be his people, and God himself shall be with them, and be their God. And God shall wipe away all tears from their eyes; and there shall be no more death, neither sorrow, nor crying, neither shall there be any more pain: for the former things are passed away. And he that sat upon the throne said, Behold, I make all things new. And he said unto me, Write: for these words are true and faithful” (Rev. 21:3-5). “God shall wipe away all tears from their eyes” (Rev. 21:4). Considering all of the heartbreak and sorrow that this world has seen, this would seem impossible—were it not for the incomprehensible greatness of God—and the compassion, mercy (grace) and purpose that He holds for all humankind. There are yet many fine points of God’s holy Plan that we do not yet fully understand. And yet we should never doubt the compassion and care that God has for us, for “even the very hairs of your head are all numbered” (Luke 12:7, Mat. 10:30). Many Scriptures speak to the re-gathering (to God) of the Children of Israel (as a whole); yet realizing the individual care that God has for us, and considering God’s great promise to wipe away all our tears, we should expect that He will provide many astonishing miracles and heartwarming kindnesses for His people. “And it shall come to pass, that before they call, I will answer; and while they are yet speaking, I will hear” (Isa. 65:24). “Sing, O barren, thou that didst not bear; break forth into singing, and cry aloud, thou that didst not travail with child: for more are the children of the desolate than the children of the married wife, saith the LORD” (Isa. 54:1). “Fear not; for thou shalt not be ashamed: neither be thou confounded; for thou shalt not be put to shame: for thou shalt forget the shame of thy youth, and shalt not remember the reproach of thy widowhood any more” (Isa. 54:4). “For thy Maker is thine husband; the LORD of hosts is his name; and thy Redeemer the Holy One of Israel; The God of the whole earth shall he be called” (Isa. 54:5). God is aware of our every need—even more than we ourselves are. God is aware of every loss, every sorrow, every Absence. Christ’s return, and His government, will ultimately represent “the times of restitution of all things” (Acts 3:21). Let us look forward, in faith, with trust and anticipation, for all of the healing and joy that God will provide for every human being who will come under His boundless grace, and His abundant and powerful compassionate provision! After describing these annual holydays, God says: “These are the feasts of the LORD, which ye shall proclaim to be holy convocations . . . besides the Sabbaths of the Lord” (Lev. 23:37-38). These Holydays—Annual Sabbaths—in addition to the weekly Sabbath of the Lord, provide the details of God’s holy Plan. SUNday is the weekly rest day of this modern churchianity, but the Sabbath is the day of the LORD. Christmas, New Year’s, Easter, and most other holidays have come directly from paganism; but these are the seven annual Holydays of the Lord! The pagan holidays of this world are, generally speaking, a counterfeit mockery of God’s Truth and true Plan of Salvation. Yet the true Holydays of the Lord reveal the blueprint of God’s holy plan for humankind—the understanding needed to obey Him and fulfill His holy will in our own lives! The Truth—as revealed through these commanded holy convocations—is the most profound and priceless understanding that we can possess in this life! It is no wonder that the adversary, who will be removed, hates these days, and has done all that he can to create counterfeits and lies to dissuade any that might hear from taking root (Mat. 13:4, 19). “Hear ye therefore the parable of the sower. When any one heareth the word of the kingdom, and understandeth it not, then cometh the wicked one, and catcheth away that which was sown in his heart. This is he which received seed by the way side” (Mat. 13:18-19). We would do well to understand the whole parable of Mat. 13:3-23. We would do well to heed all of the words of Christ. Very late in His ministry, shortly before His death, “Jesus cried and said, He that believeth on me, believeth not on me, but on him that sent me. And he that seeth me seeth him that sent me. I am come a light into the world, that whosoever believeth on me should not abide in darkness. And if any man hear my words, and believe not, I judge him not: for I came not to judge the world, but to save the world. He that rejecteth me, and receiveth not my words, hath one that judgeth him: the word that I have spoken, the same shall judge him in the last day. For I have not spoken of myself; but the Father which sent me, he gave me a commandment, what I should say, and what I should speak. And I know that his commandment is life everlasting: whatsoever I speak therefore, even as the Father said unto me, so I speak” (John 12:44-50). “I have given them thy word; and the world hath hated them, because they are not of the world, even as I am not of the world. They are not of the world, even as I am not of the world. Sanctify them through thy truth: thy word is truth” (John 17:14, 16-17). Why Such Human Hatred of God’s Law? Even as perfect and glorious and amazing as God’s Truth is, there are still many who will argue against it and fight against it. “Because the carnal mind is enmity against God: for it is not subject to the law of God, neither indeed can be” (Rom. 8:7). In God’s plan we find that human beings are created with a nature that is contrary to God (Rom. 9:20, Jer. 17:9). We discover that it is God’s intent that human beings, through a lifetime of conversion and overcoming, fulfill the exact opposite of what the adversary and what “the angels that sinned” have done (2 Pet. 2:4), effectively reversing the pattern of dire consequence. Thus, the truly called and converted verify that they will not become rebels as the fallen angels did; rather, through a lifetime of overcoming and living God’s way, they show that they are faithful and trustworthy to receive eternal life (Luke 20:35, Rev. 3:4). Why should we try so hard to overcome—to obey? Why should we deeply care, and why pray to God? Why should we humble ourselves, why do we fast? Why should we want to study God’s word and learn? Why should we be so vigilant concerning the devil? Why should we staunchly defend the Truth of God? We’ve seen that the end of this age is brought about with “a time of trouble, such as never was since there was a nation even to that same time” (Dan. 12:1). “Alas! for that day is great, so that none is like it: it is even the time of Jacob’s trouble; but he shall be saved out of it. For it shall come to pass in that day, saith the LORD of hosts, that I will break his yoke from off thy neck, and will burst thy bonds, and strangers shall no more serve themselves of him: But they shall serve the LORD their God, and David their king, whom I will raise up unto them (Jer. 30:7-9). But the lessons of human history have not began with the great tribulation (Mat. 24:21, Rev. 7:14), neither will they end there. As we’ve seen through the plan of God, we are still in the process of being created. He has a desire for the work of His hands (Isa. 29:23; 45:9-11). Yet in this process, He has never removed our free moral agency or the complete freedom to choose which path we shall take (Deut. 30:19, Jos. 24:15, Rom. 13:12; 14:19, 1 Cor. 5:8; 7:1, Gal. 6:10, Phil. 3:14-16, 1 Th. 5:6, Heb. 4:11, 16; 6:1; 13:13, 15). If we read the Word of God with consideration and understanding, we realize that God has always desired our obedience to be freewill—of our own agreement by free choice and volition. In an absolutely true and astonishingly vivid way, we are participating with God in the act of creation—the creation of ourselves! God desires us to willingly choose His way, to willingly grow in living that way which is in our own best interest (Deut. 5:29). God desires us to willingly, joyfully, become infused with His Love, which builds the character that will always do what is right and best for ourselves, and for others (Rom 5:3-5; 13:10, 1 Cor. 13:4-7). Yet the sad reality is that we—human kind—are all too often our own worst enemy. As human beings, most any of us, right now, can instantly recognize what an affront it would be—what an emptiness it would be—if God created us like automatons, or robots, or “wind-up toys,” with no freewill—no individuality, independence or freedom to choose—to choose to be who and what we desire to be. That is both the astonishing beauty, and the great enigma, of the creation of humankind. We are free moral agents. Though there is a consequence for doing evil, we so often still struggle with doing evil. And we so often find it difficult to do that which is truly good. “For I know that in me (that is, in my flesh,) dwelleth no good thing: for to will is present with me; but how to perform that which is good I find not. For the good that I would I do not: but the evil which I would not, that I do. Now if I do that I would not, it is no more I that do it, but sin that dwelleth in me. I find then a law, that, when I would do good, evil is present with me. For I delight in the law of God after the inward man: But I see another law in my members, warring against the law of my mind, and bringing me into captivity to the law of sin which is in my members. O wretched man that I am! who shall deliver me from the body of this death” (Rom. 7:18-24)? Thus we see that complete freedom comes via God’s help, through the Holy Spirit (John 8:32; 16:13), whereby we may truly Live. So How Are the Lessons of Life Written? They will either be written into our own hearts and minds… or they will be written into the dust and ashes of history. As we know, there is a consequence for sin. And God would not be God, were He to deny the seriousness and consequence for sin. He would be a liar, were He to deny, or to not tell us, of the ultimate penalty for our sins—death. God has made it possible for us to be forgiven, our guilty past erased through Christ our Creator (John 1:1-3)—yet it is true that His whole purpose for our very lives—and the real reason He has created us and subjected us to this fragile existence—is in the hope that we would develop the very character, the very love, the very nature of Himself, that we may ultimately finally be born as His children, sons and daughters of the living God, to live with Him forever (Rom. 8:20-21, 27-30, 2 Cor. 6:16-18)! God is looking into our “inner man,” to see what we are and what we are becoming (1 Sam. 16:7, Eph. 3:16-19). Among the final lessons of human history, are not only the events of the horrible tribulation to come… but at the end of the millennium… at the end of the thousand years, when there has been peace, and prosperity, and every physical and spiritual blessing, the earth now “full of the knowledge of the LORD, as the waters cover the sea” (Isa. 11:9), the unbelievable occurs. Then, in the midst of “paradise on earth,” and the Government of God over the whole earth, when Satan is released for “a little season” (Rev. 20:3), then will come a time of deception to which the “nations in the four quarters of the earth” led by Gog and Magog will succumb: “the number of whom is as the sand of the sea” (Rev. 20:8-9). Though it is true that God does not allow their destructive plan to succeed, and in His Love and Faithfulness He prevents the harm they desire to inflict by sending “fire . . . from God out of heaven, and devour(ing) them” (Rev. 20:9). There are vital supreme lessons that God desires us to learn from all of this . . . Here, at the very final consummation of God’s holy Plan of Redemption—here, at a time that everything could not possibly be more ideal, more perfect—yet even now, due to human nature, and the evil pride, arrogance, selfishness that pervades our very beings (Eze. 38:8-12), multitudes will conspire against God and against all of His people living peaceably in Jerusalem. How astonishing! After all that God has done and will be doing, how would, how could, multitudes still rebel? And yet, they will be destroyed—and will write those lessons of human history in blood, and dust, and ash. What Can and Should We Learn From All of This? We should realize that God’s holy and perfect Plan of Salvation is completely encompassed in the promises and assurances that our holy God and Savior has made freely available at an incomprehensible price through Christ’s Sacrifice as our Savior. We should also realize that God has never, and would never, remove our free moral agency. In fact, it is that very free moral agency that He hopes and desires we will willingly transform, and conform, to His likeness, and His holiness—for that is the only way to life and peace and true joy and spiritual abundance, and that is the only way that humankind can truly be made free! God, our Father, and His Son, Jesus Christ, are the only source of life and truth, and They have outlined a Plan of Salvation with an eternal fulfillment that is beyond our wildest dreams or our deepest comprehension (Isa. 64:4, 1 Cor. 2:9). Only by the miraculous transformation He has laid out before us, through His plan, can we then understand His truth and His true will and purpose, and only thereby can we enter into salvation and experience true life through His Spirit in us (Col. 1:27). May our Eternal God and Father, who always has been, and who always will be, with His Holy Son who loved us and died for us, truly and thoroughly provide the strength and help that we need, through the Holy Spirt, that we may be strengthened by His Spirit in the inner man, “That Christ may dwell in your hearts by faith; that ye, being rooted and grounded in love, May be able to comprehend with all saints what is the breadth, and length, and depth, and height; And to know the love of Christ, which passeth knowledge, that ye might be filled with all the fulness of God” (Eph. 3:17-19)!